I don't usually review urban eateries however I discovered a burger place wedged between an overhead freeway and an overhead toll way. If you squint your eyes it kind of looks like the old Girvin Social Club in Girvin, Texas and it is in the middle of nowhere. I first noticed this place several years ago as I dashed westbound on Westpark Drive heading to the newly opened Westpark toll road. I caught a glimpse of "Bubba's" out of the corner my eye and I thought, "That looks like a biker bar." I had to pass it a few more time in the next few months and if I remembered to look at all I would try to figure out exactly what it was and how to even get into the parking lot even though it always seemed to be full at meal time and almost full at other times. Finally in the past several weeks I have driven by "Bubba's" at least once a week and sometimes as many as the three times a week. 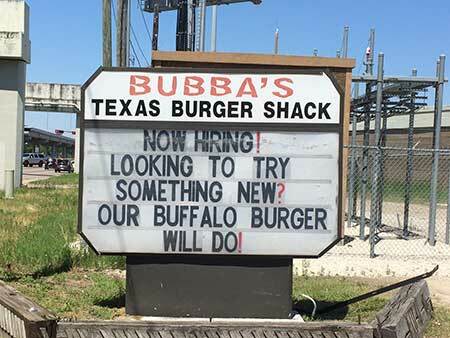 With each passing I gleaned more information, the name of the place "Bubba's Texas Burger Shack" and how to get into the parking lot. 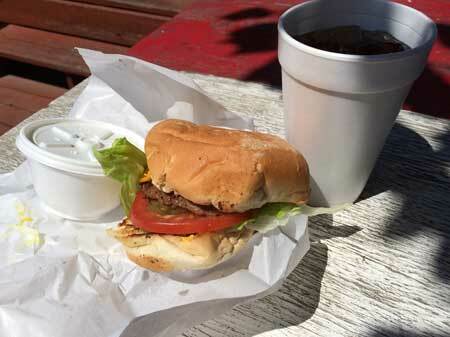 I also learned the "Bubba's Texas Burger Shack" was family owned and had been at his location since 1985. It's the only remaining business along this short stretch of Westpark drive, due to Southwest freeway construction and the opening of the Westpark Tollway in August of 2005. 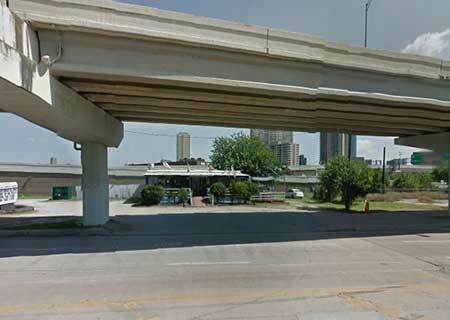 At one time during construction of Westpark Tollway "Bubba's Texas Burger Shack" became an island and the only way faithful customers could get there was to hop the curb at Rice and drive through an empty lot and the construction site to get there, because Westpark Drive was completely shut down. Last week everything lined up, I would be heading westbound on Westpark Drive. It would be about 11:00 AM. I had figured out how to get in the parking lot and it had both "Texas" and "Burger" in its name. I knew this would be a good day. 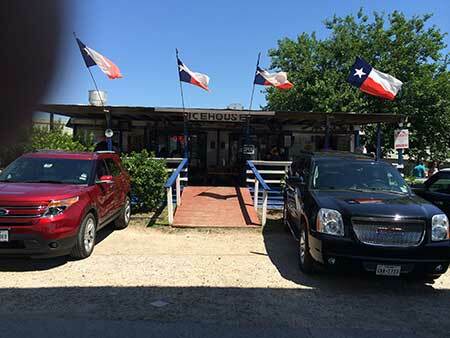 There a few tables inside but most of the sitting is out on the porch and this was a beautiful spring day in Houston. We went inside to order. We ordered one burger (beef) with everything on it, one mushroom jack burger (beef) with everything on it, one cheese burger (buffalo) with everything on it, three cups of jalapeño potato salad, and three diet cokes. When it is ready they will bring it out to you. The burgers were great, you need to eat them with a napkin but that's not a bad thing, "with everything" means: mayonnaise, mustard, lettuce, onions, tomatoes, pickles. Of course you can order your burger with any combination of these listed or add other things like BBQ sauce, ketchup etc. but I wouldn't. You can also add jalapeños to your burger which I will do next time. The jalapeño potato salad was a pleasant surprise. It had a great flavor with a little bite but not too much. One other thing of note, the diet cokes were served in the can with a cup of ice. The cokes were ice cold so I'm sure their beer is too. The buffalo (bison) meat in my buffalo cheese burger was great. I've had buffalo before and it can be dry but this was not. Buffalo meat has less fat content than turkey. I was tempted to order buffalo for the others even though they requested beef, but I didn't. If I had I don't think they would have known the difference. So how do you get in the parking lot? The best and easiest approach is driving west bound on Westpark Drive from the 610 Loop be in the far right lane and put on your right blinker, slow down ready to find a cut out in the curb, it's right there, pull in, if you missed the cutout there is one more, if you're in a pickup, jump the curb! It's worth it. Tell them Texas Bob sent you!